The Liebert Mini-Mate2 is designed for precision cooling, humidity control and air filtration of small areas, such as computer, control and equipment rooms, Liebert Mini-Mate2 installs above a dropped ceiling. The system is easy to install and service, and requires only front access for maintenance. This server room cooling unit is available in nominal cooling capacities from 3.5 to 28 kW (1 to 8 tons). Air, water, glycol and chilled water models are available in 50 and 60 Hz. All chilled water systems are self-contained units; air, water and glycol cooled models are available in split system configurations. High Sensible Cooling Capacity. Unlike "comfort" air conditioners, Liebert systems are designed for the cooling requirements of electronic equipment - 80% of the capacity dedicated to the removal of dry "sensible" heat, and 20% for the control of humidity. Reliable. Based on a field-proven system, the Liebert Mini-Mate2 is manufactured with rugged, efficient components. To ensure 365 days x 24 hours operation at your site, each system is factory tested. Preventive Maintenance Programs. Liebert factory-certified personnel provide regular inspections and service to extend the life of the system. Liebert Spare Parts. Highest-quality parts, designed for your system, are easily available through your Liebert service representative. Agency Listed. Standard 60Hz units are CSA Agency listed/certified to meet U.S. and Canadian safety standards, and MEA listed for New York City applications. These agency listings ensure fast, hassle-free inspection and building code approvals. High-Efficiency Compressor. The rotary or scroll compressors are both energy-efficient and rugged, to ensure continuous operation. Is the Liebert Mini-Mate2 the best server room cooling solution for your cooling needs? Our engineers can help you select the best server room cooling solution for your cooling needs. 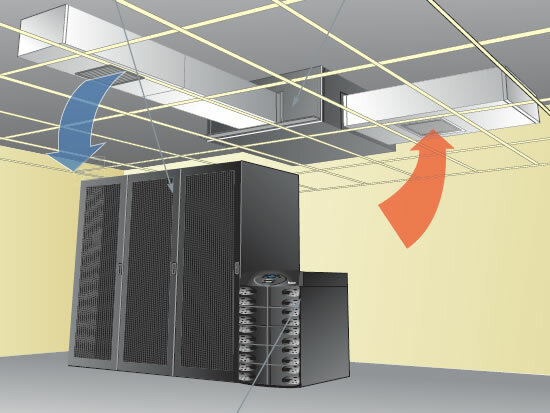 Click here or Call 1-800-638-2638 for a free server room cooling project evaluation. Self-contained or split systems - allows for fitting systems with a variety of architectures. Reliable refrigeration components featuring rotary or scroll compressors and copper tube aluminum fin coils for high efficiency. Easy-to-use menu-driven microprocessor control. Optional room sensors available. 1-3 ton models with grille/plenum to fit 2'x4' ceiling grid for direct supply and return air distribution. Filter box, fan speed and/or blower options to handle ducted applications. Choice of hot water, stainless steel or stainless steel with SCR reheat. Hot gas bypass for low load applications.